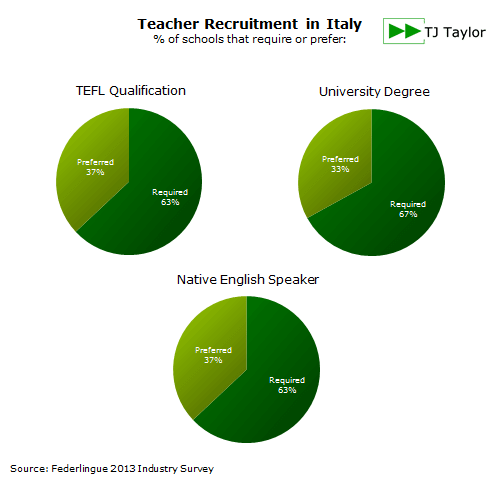 How is the Job Market for Teachers in Italy? (Updated 2019) Smaller towns often have more open positions for English teachers than qualified applicants to fill them, and even in larger towns and cities a qualified, reasonably experienced teacher with all papers in order will have no problem finding a job. Larger cities normally have a very large potential pool of ‘teachers’, but many of these are occasional teachers/housewives, foreign students or babysitters. A common, and normally successful, route to finding a job is to move to Italy and then start looking. The ESL job market as a whole seems to be holding up quite well. The corporate market has slowly been shrinking, in part because courses are moving online or to telephone lessons, in part because publicly funded courses are less popular, and in part because of the generational shift inside companies. However, the quality of those courses and of the in-company teaching positions available has generally improved, especially in the big commercial cities such as Milan, Turin and Rome. The number of in-school positions advertised this year seems similar to previous good years, and the constant turnover of teachers will always provide job openings for good, qualified teachers, especially during the traditional recruiting windows of September and January. Although finding a job is relatively easy, the high turnover is because the quality of the jobs available to new teachers is often very mixed, especially in the cities. Teachers recruited into a small town will often have a reasonably stable income, even if for only a few months, but most positions offered in the larger towns and cities are as independent or freelance teachers. Income can be very erratic, with a high rate of lesson cancel­lations, uncertain course renewals, last-minute confirmations, public holidays and transport strikes, as well as widely varying rates of pay and conditions. Initially most new teachers work simultaneously for 2 or 3 different schools in order to have a reasonable schedule and income, and to get a feel for the better employers, filling gaps with private lessons or summer school work. A hot area for teacher recruitment currently is children and young learners, owing to the large number of kindergartens that are opening and the push for more English language education in state schools, as well as the usual summer schools and camps. Teaching children is also one of the few areas that is relatively open to non-native English speaking teachers, as the majority of teachers working in-school and in-company are native English speakers. This is slow to change, mostly because of the large supply of native English speaking teachers attracted to Italy, and the cultural resistance of Italians (who often complain about the poor level of their non-native English teachers at secondary school). Most of the state school positions are filled via tenders or by language schools who act as agencies, but there are also some positions available for individual teachers, especially in southern Italy, who have the right information, contacts, and lots of patience. The best places to find a teaching job are EasyMilano, which covers Milan and the surrounding areas, and WantedinRome. There are also some international recruitment sites such as Tefl.com, which are more popular with schools in remote areas or where the local job market is tight. It’s also a good idea to check out the careers section of the schools which are listed as members of one of the industry associations listed in the FAQ on what to look out for in a school. That FAQ also includes a good explanation of the 4 different categories of English school in Italy, and how this influences pay and conditions, and the type of teacher they hire. If you prefer to look for a job from your home country, you should probably be prepared to make at least one visit to Italy to verify that everything is as you would expect, but only relatively few schools in Italy recruit directly from abroad. In any case, besides in the tourist hotspots of Rome, Venice and Florence, a qualified English mother tongue teacher will find a job reasonably easily – choosing a good professional English school is the difficult part, and best done during a visit.